specifically if traffic is the reason for your delay. With NaviExpert, you can simply avoid traffic. All this is enabled thanks to anonymous information about speeds with which cars are moving on particular roads. The data is obtained from users of the NaviExpert Navigation, the Rysiek Speed Camera Alert System as well as from the professional fleet monitoring system. Later, the data is processed by our algorithms. Due to the above, the app knows where there is traffic and how to avoid it. Forget about those surprising tickets from speed cameras. We will notify you about speed cameras and police traffic checks in advance. The system displays information about speed cameras, police traffic checks, dangerous areas or accidents. The data is obtained from submissions of drivers using NaviExpert, from another one of our apps - Rysiek, and from information obtained from traditional CB radio as well as from monitoring of radio stations and the Internet. The information is additionally verified by a team of moderators. Follow the new and try out the latest roads first! For you, we update our maps daily. 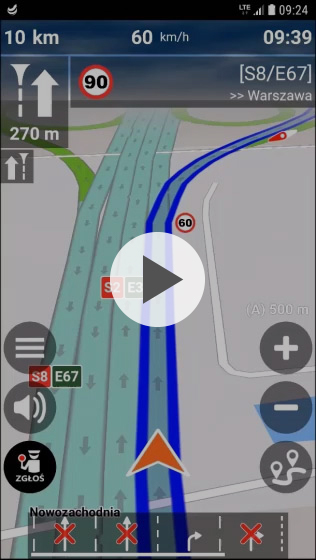 The app working in online mode, uses the latest maps that contain the newest road sections, information about roadworks and changes. NaviExpert provides a convenient and fast access to the current POI database. Let us please you by finding a parking space that will always wait for you. At NaviExpert, they are guaranteed. NaviExpert displays the proposed car parks located near the destination of the user's trip. Prior to going on your trip, it will notify you about the distance to the nearest car park, parking costs and type of parking space. NaviExpert will also present information about paid parking zones, while making it possible to pay for parking through the app, in cooperation with SkyCash. Always on the right track. It is easy with the lane assist system. The assist system notifies the user in advance about lanes available on intersections and which directions they can be used for. This will enable you to decide which lane to stay on in advance. Feel like a fighter aircraft pilot. 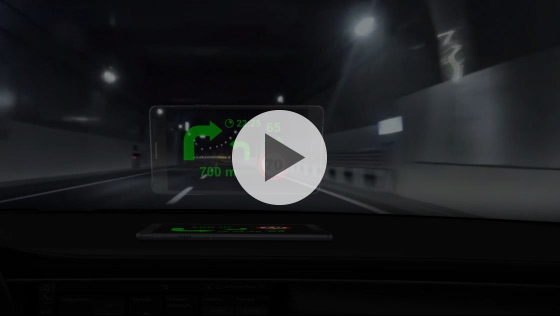 The navigation is also equipped with a HUD, which thanks to the mirror reflection, presents information about the upcoming manoeuvre, distance to it as well as the speed limit and current speed of the vehicle, on the windscreen of the vehicle. This mode will be specifically useful to drivers who often travel at night.